The reader tips just keep on coming… After this morning’s post about Poor House Brewing Co. applying for a Type 23 license at a location on 30th St, a reader that would like to remain anonymous tipped me off that Stone Brewing Co. has set it’s sight on Oceanside. Earlier this week Stone Brewing Co. applied for a Type 01 Beer Manufacturer license (the same type they have at the Stone Company Store South Park) for 310 N Tremont St in Oceanside. I’m not too familiar with Oceanside, but this location is just off the North Coast Highway near Mission Ave not far from museums, a movie theater and the Oceanside Pier. If I remember right from the last time I was up there the area has a lot of shops and restaurants and sees quite a bit of foot traffic, especially in the summer. It’s unclear at this time if Stone will be brewing beer at this location or if it will operate like the South Park location with merchandise, bottle sales, growler fills and tasters. Based on the name on the license and the license type being the same as the South Park store I would bet the latter to be the case. At this point the details might not be set in Stone yet (pun intended) as it’s so early in the license application process that things could change at any moment. If the license is approved and Stone opens this Stone Company Store in Oceanside it would be their third or fourth beer related location depending upon timing (they also operate Stone Farms). Escondido is home to the brewery, Stone Brewing World Bistro and Gardens restaurant, the original Stone Company Store and a hotel is in the works. Stone Company Store South Park opened on 30th St in June, 2011. Stone is currently working to open a second Stone Brewing World Bistro and Gardens in Liberty Station, which is planned to include a restaurant, 10 barrel brewhouse and Stone Company Store selling merchandise, growlers and beer. I’ve emailed Stone for comment and will update this post if I get any more info. Update: I heard back from Randy Clemens, Stone’s media guy, he confirmed that they are planning another Stone Company Store in Oceanside and are hoping for an early summer opening. It will be similar to the Stone Company Store South Park in that they won’t be brewing on site, but Clemens promises it won’t be cookie-cutter copy. He says they’re still in the early planning stages but hope to share some more details about what will differentiate the store in Oceanside in the coming weeks. As I blogged last week, Stone Company Store South Park is set to have their soft opening next Wednesday, June 15th followed by a grand opening celebration a week later. I just got some more info on what to expect at the soft opening as well as the grand opening on Wednesday June 22nd. For the soft opening on the 15th they’ll have a keep the glass special, four 4oz tasters for $5 in addition to the regular growler, bottle and merch sales. But the grand opening celebration isn’t limited to just Stone’s store in South Park. They’ve sent some vintage beers out to neighboring bars, restaurants and liquor stores so they can get in on the action for the night as well. Whistle Stop Bar, Station Tavern & Burgers, The Rose Wine Pub, Vagabond, Mazara Pizza & Italian Deli, California Liquor, Big Save, Grant’s Marketplace, and Ray’s Liquor Center. I’m told Station, Vagabond and The Rose will have some sort of beer and food special, while Whistle Stop will be doing a keep-the-glass night. UPDATE 6/22/2011: See below (or read more from the main page) for a full list of events at each location, including where the different beers will be available. The wait is (almost) over. In just under two weeks, on June 15th the Stone Company Store South Park, located at 2215 30th Street #3, will open their doors to the public. It’ll be a soft opening but the beer will be flowing. A grand opening celebration is being planned for shortly thereafter but the details of which are still be worked out (I’ll post those as soon as I have them). Stone first announced their plans in September of last year to open the store in South Park with news slowly trickling out over the next couple of months. At one point they had planned to brew pilot batches on site, but a couple of weeks ago announced that they wouldn’t be brewing in South Park after all, opting for a much larger pilot system at their recently announced Stone Brewing World Bistro and Gardens Liberty Station. Image courtesy of Stone Brewing Co.
Stone Brewing Co. is holding a press event today which I and many other beer writers and bloggers will be attending. Stone is expected to make some big announcements but exact details are still mostly under wraps. Stone will open a 400-seat restaurant at Point Loma’s Liberty Station, complete with bocce courts, and outdoor movie area and beer garden and a small brewery onsite. Stone will expand their current space in Escondido allowing them to produce up to 500,000 barrels a year (Stone’s estimated capacity this year is 150,000 barrels). Stone has acquired an 18.7 acre farm (formerly La Milpa Organica) to provide organic produce to their restaurants. Let’s hope Stone left out at least few details from the above story and there are some surprises in store for us still. Myself and many other are sure to be posting details and pictures to Twitter and Facebook as the day goes on. You can follow me on Twitter @SDbeer or Facebook SdBeerBlog or follow the Twitter hash tag #StoneDay for a feed of various people at the event. 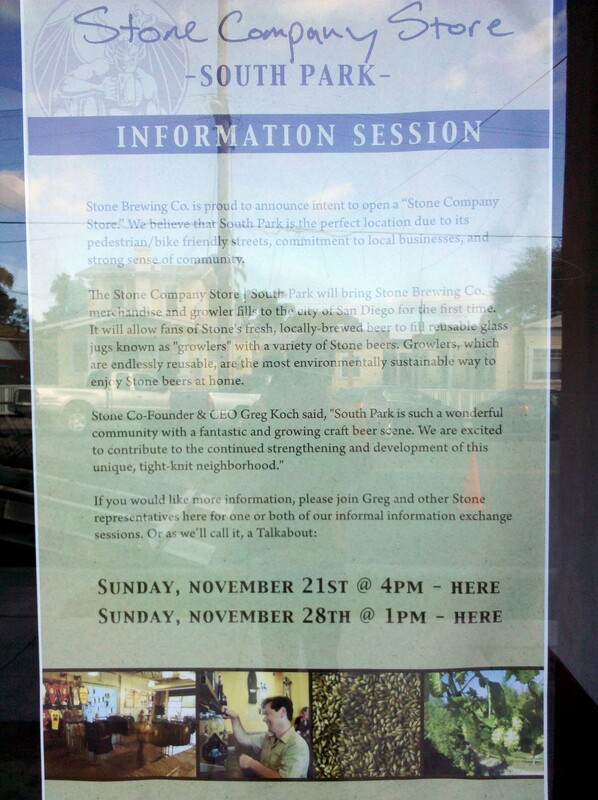 It’s been known that Stone Brewing Co. is hoping to open a store in South Park for a while now. If they get the liquor license they are applying for this location will not only be a tasting room with to-go growler and bottle sales but also a mini-brewery. Stone held a couple neighborhood meetings to chat with the community last month of which I attended the second. A handful of people were there to listen to CEO Greg Koch talk about their plans for the store, what it will and what it will not be. Most people in attendance seemed to be beer lovers and there wasn’t much (if any) resistance voiced. Koch did mention there had been concerns voiced by at least one community member and urged those that would like to see Stone come to South Park write letters of support to the ABC. Not much new info came out of the meetings, just Koch reassuring people that this wouldn’t be a bar with late hours and drunk patrons. Amy T. Granite and WestCoaster each posted summaries of the meeting with a bit more info. Hey San Diego, it looks like the @StoneStore in #SouthPark may take a while. Quite a while. Months. That’s an “if” not a “when.” Sorry. And he went on to say it was a problem with the liquor license, a slow and uncertain process due to protests. Not much else is known at this point. Koch tweeted again today that he was interviewed by San Diego 6 for the 10pm news about the problems they are having with the planned South Park store. So hopefully we’ll get more info soon. According to Koch the public comment period is over, so there isn’t much beer drinkers that want to see Stone Brewing Co. in South Park can do at this point. I have an email into Stone and will update this post with more info if/when I hear back from them. 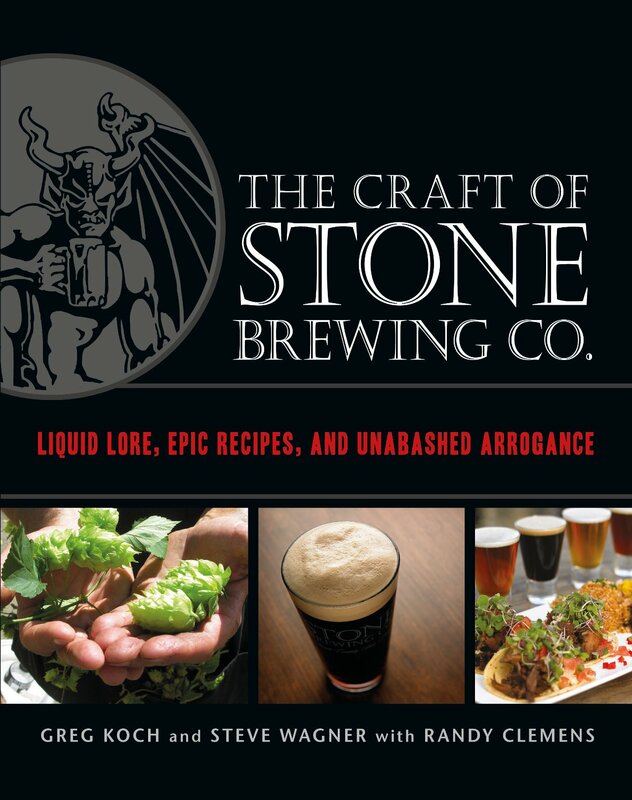 As I’m sure you know by now, Stone Brewing Co. is hoping to open a company store (which will technically be a brewery) at 2215 30th Street in South Park. They are still in the process of obtaining their alcohol permits and are holding two meetings for people to come out and get more info. The first meeting was yesterday which we missed and the next meeting will be Sunday, November 28th at 1pm at the proposed location. Here’s the text from the sign posted in the window. If you’re interested in seeing Stone Brewing Co. open their new store in South Park or have questions about it, show up and find out more info. Stone Brewing Co. is proud to announce intent to open a “Stone Company Store.” We believe that South Park is the perfect location due to its pedestrian/bike friendly streets, commitment to local businesses, and strong sense of community. The Stone Company Store | South Park wil bring Stone Brewing Co. merchandise and growler fills to the city of San Diego for the first time. It will allow fans of Stone’s fresh, locally-brewed beer to fill reusable glass jugs known as “growlers” with a variety of Stone beers. Growlers, which are endlessly reusable, are the most environmentally sustainable way to enjoy Stone beers at home. If you would like more information,, please join Greg and other Stone representatives here for one or both of our informal information exchange sessions. Or as we’ll call it, a Talkabout. Remember the Stone Company Store South Park we told you about? A few days ago we revealed the location when a friend spotted the notice of a permit to sell alcohol, and one detail of that brought up some interesting questions. The type of permit Stone Brewing Co. is applying for at their upcoming South Park location is a “Type 23 – Small Beer Manufacturer”. As you might imagine that suggests they’ll be making beer on premises in South Park. We confirmed with Stone that they will indeed have a small pilot brewing system on site. They’ll be brewing in South Park. Yes, if all goes according to plan 30th Street will be getting a (small) brewery. This raises some interesting possibilities, that we by no means have any insight into, just speculation and hope. One possible reason for this could have to do with California liquor laws, this could be a clever way to be able to fill growlers. We won’t get into all of the details, but the way we understand it is that in California, only breweries are allowed to fill growlers. Stone says the focus of the Stone Company Store South Park will be to provide the local community with fresh beer to go, so obviously growler fills will play a big part in this. 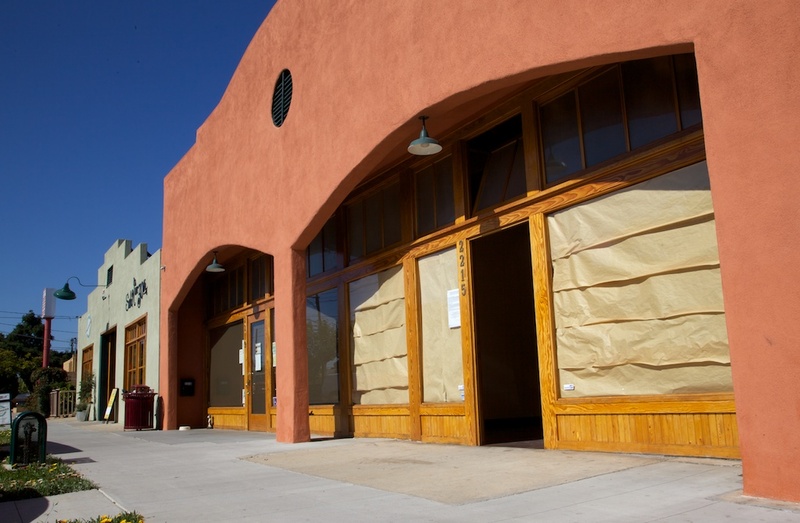 Having a brewery on site will allow them to fill growlers, not only with beer brewed on site, but also with beer brewed at the main brewery in Escondido. If the Stone Company Store South Park weren’t a brewery they wouldn’t be able to fill growlers at all. Another, more interesting possibility is that they could produce some beers in the South Park location that they otherwise don’t normally make. Breweries use small pilot systems to test new ideas, brewing on a small scale means that if a beer turns out terribly the financial loss is lessened. We could see some new beers, experimental beers and otherwise not normally produced beers from Stone coming out of the South Park location. Again, this is all (hopeful) speculation, but there could be some interesting small batch, draft only beers coming out of their South Park location in the future. Another bit of news we confirmed with Stone is that they’re seeking the ability to sell on premises tasters and pints, but again, their focus is on beer to go. They emphasize that the Stone Company Store South Park isn’t a pub. One thing to remember is that this is all subject to change. Stone is still in the process of applying for their permit to sell alcohol. The guys from West Coaster ran into Greg Koch, CEO of Stone just last night and chatted about the upcoming South Park location. He suggested that if you want to see the Stone Company Store South Park get the proper permits they need to open you write letters to the ABC showing support. A few months ago we blogged about Stone Brewing Co.’s plans to open a store, complete with growler fills, in South Park. There was much speculation about where it would be located, but Stone declined to state the exact location at the time. I followed up with them a few weeks ago and they still weren’t revealing the location, but did say that due to permitting delays the opening of the store would probably be delayed until early next year. 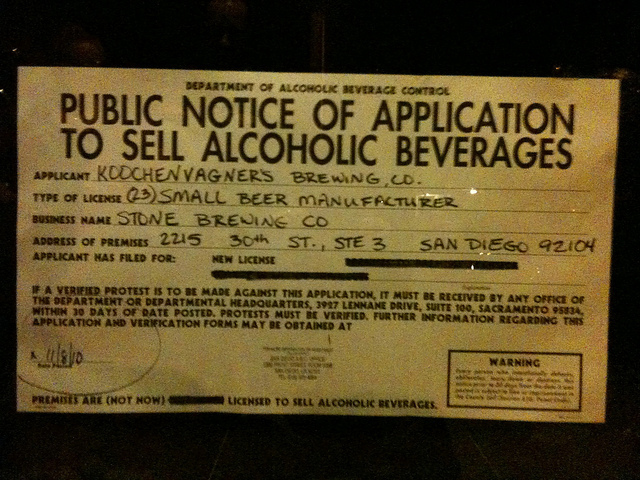 Stone Brewing Co.’s alcohol permit application notice has been spotted, at 2215 30th Street where many people expected it to be. We’re anxiously awaiting the opening and will keep you posted when we hear more news.